Are you sure SAMSUNG WD90K6410OX/TL 9 kg Fully Automatic Front Load Washer with Dryer is not available in market? SAMSUNG WD90K6410OX/TL 9 kg Fully Automatic Front Load Washer with Dryer from Samsung is listed in Washing machines category in revaalo. 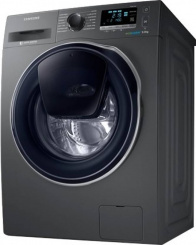 Reviews,Ratings, details and specifications of SAMSUNG WD90K6410OX/TL 9 kg Fully Automatic Front Load Washer with Dryer. It comes with 3 Years Warranty on Product and 10 Years Warranty on Motor. The product is brilliant. Samsung service is also good. The price is little costly. I have been using this from over 1 year now. Previously I had Whirlpool that was also good. But this one is more value for money I guess. Front feeder washes well. Front feed, hence the washing quality is good.